The Great Route of Flores travels along the coastal landscape of the island, connecting the main village Santa Cruz to the civil parish of Lajedo, located on the southwest coast, through a linear route with high difficulty level. Some parts of the trail have steep descents, such as the one in the Rocha do Risco, therefore this section is forbidden for people with vertigo. 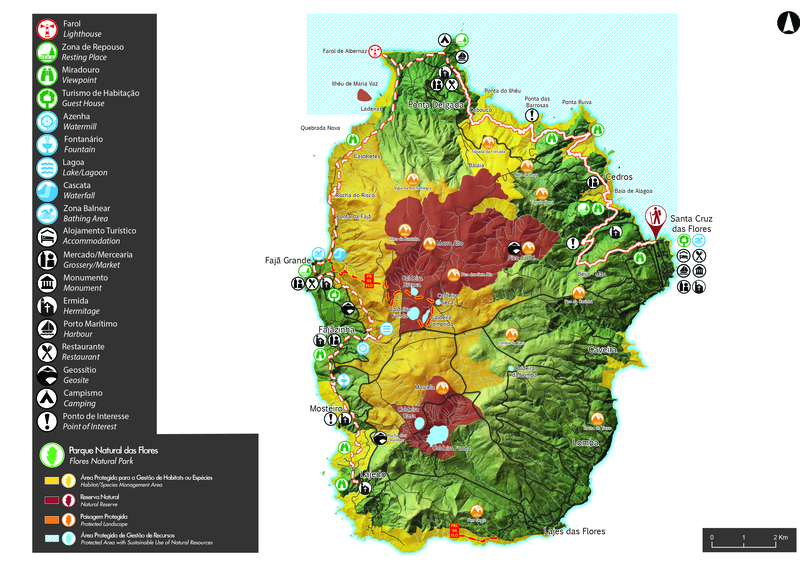 This route presents a great variety of volcanic landscapes, complemented by the existence of small villages and a vegetation with a lot of endemic species, namely in the Northeast coast and in the cliffs of the West coast. Whenever possible, you can profit from the numerous bathing areas along the route and, as you walk by the rural centres, you can purchase any supplies you might need or even stop at any restaurant, namely in Ponta Delgada or Fajã Grande. This hike has two stages of approximately 21 km and 26 km. 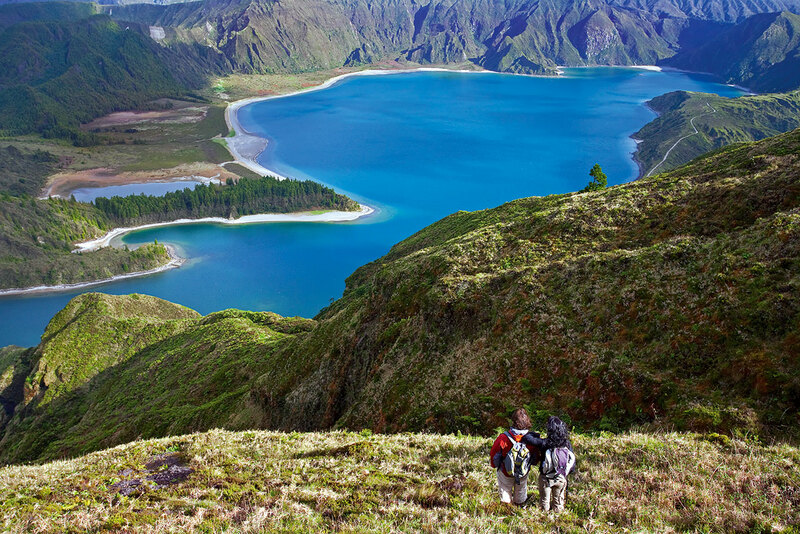 The first one connects Santa Cruz to Ponta Delgada and the landscape is characterized by inumerous and extensive valleys with several streamlines, that led to the construction of a Hydroelectric Power Plant, located on the initial stretch. In addition, the stage runs along the northeast coast, where you can see high cliffs, inumerous islets and coves, that provides an important nesting area for several species of seabirds. As for the second stage, which connects Ponta Delgada to Lajedo, the initial low and linearized coastal line between Ponta Delgada and Ponta do Albernaz gives place to one of the most beautiful coastal landscapes of the Azores, where the lava and detrital fajãs such as Fajã Grande and Fajãzinha are separated from the central plateau of the island by a long fossil cliff, with about 300m of height, where several streamlines flow, resulting in impressive waterfalls, with the main highlight called Poço da Alagoinha - a little lagoon on the base of the cliff. Small villages such as Mosteiros, the less populated civil parish of Portugal, are a special charm to the surrounding landscapes. You should plan your walk according to your physical ability, interests and availability. As it crosses several streamlines, be aware for flood rise after high precipitation events. 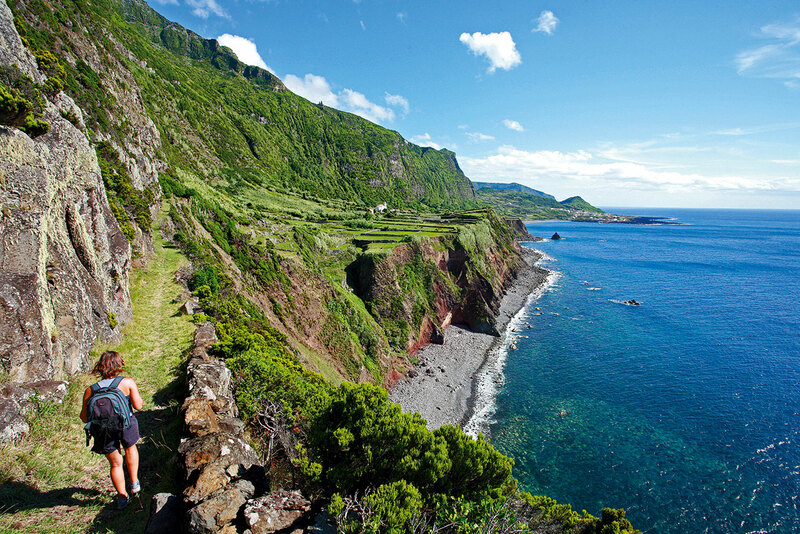 The Great Route of Flores beginning in Santa Cruz das Flores (East area) goes through the North until Ponta Delgada (first stage), continues South along the West coast (Fajã Grande), ending in Lajedo (Southwest), on a total of 47 km length. There are sections where the stone ground may be slippery, being advisable caution and the wear of proper footwear. This leg begins on the North part of the airport runway. With Corvo on the horizon go left, along the road, until the high area of Beija Mão where it is possible to profit from a view over the villages bellow. From here the path goes down, passing by the Recreational Forest Reserve of Luís Paulo Camacho and further ahead, the Hydroelectric Power Plant. Cross the dam and continue parallel a levada (irrigation channel) by a land road, direction sea. Arriving the regional road follow the markings, with the village of Fazenda on your right, towards the Baia de Alagoa. Continue by a land road on your right, crossing a picnic area with a view over the islets and follow near the coast heading Cedros. Cross this small district towards Ponta Ruiva, Northeast of the island. 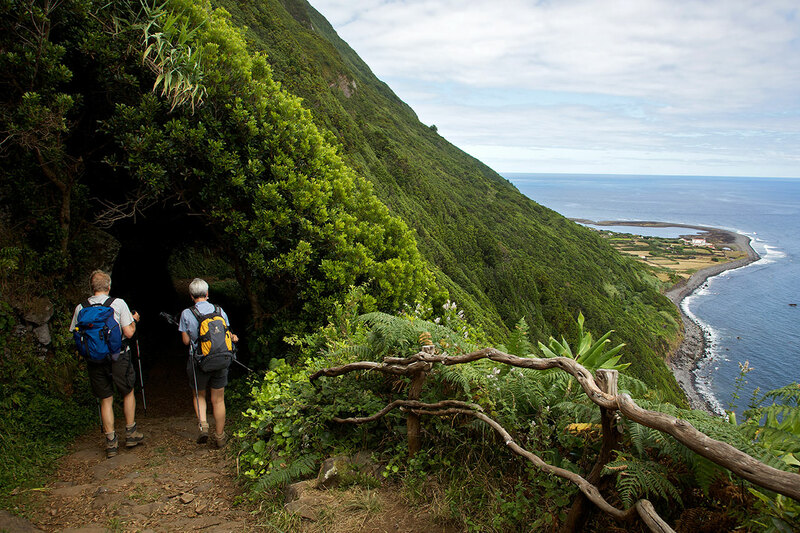 From here, the walk continues to Ponta Delgada along the coast, passing by places of great natural beauty such as Ponta das Barrosas where there are remains of an old settlement, Cabouco and Pico do Meio Dia. Along this road it is possible to enjoy several examples of endemic flora such as Azorean Heather (Erica azorica), White Wood (Picconia azorica) and Azorean Holly (Ilex azorica). Reaching Ponta Delgada, pass by the Chapel of Nossa Senhora da Guia and end the section at the center of the village, near the Casa do Povo. Begin the stage near the Casa do Povo with Corvo island on the horizon. Along the trail, whenever necessary to cross a gate, always leave it closed. There are some parts where the stone ground may be slippery and after heavy rainy days the riversides water flow increases, being advisable caution and the wear of proper footwear. Follow the road among pastures and agricultural fields until the road turns South. At this point there is a detour on the right, to the lighthouse of Ponta de Albernaz. After visiting the lighthouse proceed South. Approximately with the islet of Maria da Vaz on your right, leave the tarmac and follow the land road ahead. Go down Rocha do Risco – attention for the danger of vertigo – along a forest area with big Azores Juniper (Juniperus brevifolia) until Ponta da Fajã. Follow the marks passing by the detour to Poço do Bacalhau, place with connection to other points of the island through the trail PR 03 FLO – Miradouro das Lagoas/Poço do Bacalhau and go on until the center of Fajã Grande, where it is possible to stop for a dive. Follow the markings near the cliff base by a land road and arriving to the main road, you will find a detour on your left to Poço da Ribeira do Ferreiro, island’s touristic attraction. After the detour, return by the same road, pass a watermill and continue right by a land road parallel to the stream until you reach Fajãzinha. Cross the village, go up the slop and continue along the road passing by places once inhabited such as Caldeira, until you arrive to the village of Mosteiro. Following South you will find, on your right, a viewpoint from where you can see the seashore and also Rocha dos Bordões, a geological formation known by its huge vertical basaltic columns. From here the trail proceeds South until Lajedo, pass by the viewpoint and continue until the center of the village, where the trail ends.